The early days of Spring are upon us and the overall economic gauge is much like the weather – things are starting to feel better. The truth is, things have been improving since we started recovering from the depths of the financial crisis 10 years ago. It’s just that this recovery has been much slower and drawn-out as compared to the other post-recession periods of the last 30 years. The reasons for this longer and slower recovery have been and will continue to be debated but we are finally reaching the point where people are feeling better. Unfortunately, that also means that now may be the time we should be starting to prepare for the next downturn. First, let’s look at the following chart. 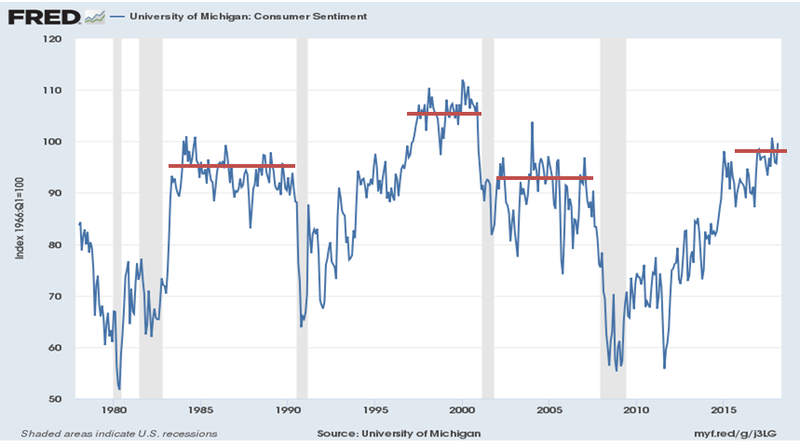 It shows the index of consumer sentiment, put together by the good folks at the University of Michigan (Who should be feeling pretty good after their team’s showing at this year’s NCAA tournament). 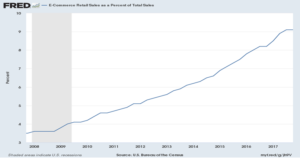 Each of the gray vertical bars represents a recession in the economy. The red lines that I added are the rough averages of the high points in sentiment between recessions. You can see we are reaching levels where consumers haven’t been this confident since the late 90’s! Even with that being the case, you can see that a feel-good economy can continue for several years before a recession hits. 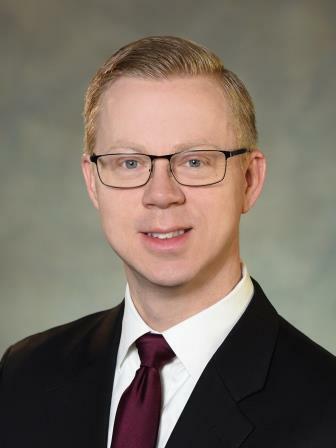 Recessions occur most often when the economy runs too hot and the Federal Reserve has to increase interest rates in order to moderate financial activity. That forced “down-shifting” occurs because of a concern of the economy overheating. Economic activity is measured (very imperfectly, but that’s a topic for another post) by the Gross Domestic Product (GDP). The rate of growth in GDP has been in the 2-3% range annually, and it has been for some time. That’s not exactly scorching growth. What could heat things up? Let’s look at a few areas. The housing market took a huge blow in the great recession, from which it still has not fully recovered. Housing is important because of the all the additional benefits to the economy that occurs when houses are built, bought or sold. For instance, building a house requires a crew of people who make pretty good money with which they buy trucks, tools, and materials. Furthermore, once someone builds a house, they have to furnish it, which means they go to the store to buy furniture, appliances, flooring, and other things. 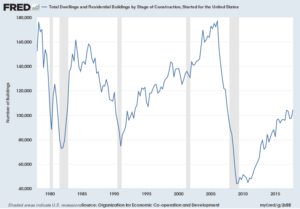 The next chart shows buildings that have started construction in the United States. While we have seen a recovery from the depths of the crisis we are still only building at levels last seen in 1990. 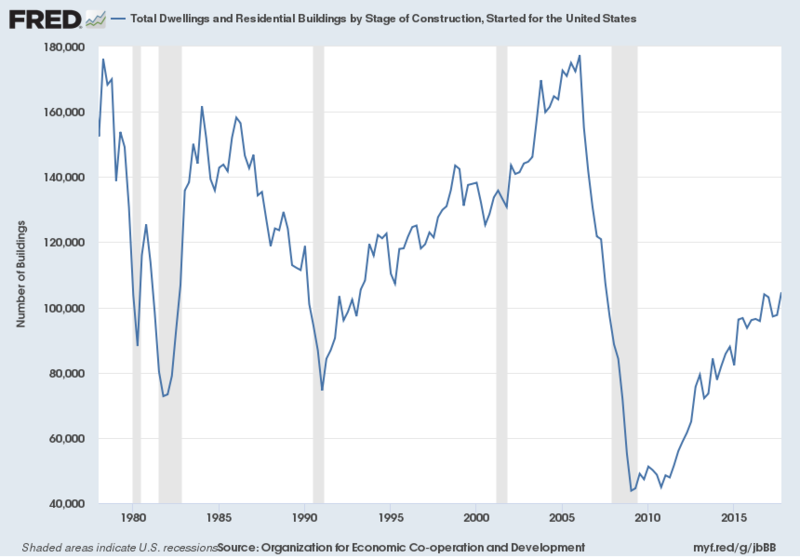 Despite rising construction costs, a lack of existing homes on the market could spur this building trend to continue growing. Some people point to unemployment statistics to indicate we may be getting close to recession. Full employment is a level where most people who are looking for a job can generally find one. That figure is generally considered to be around 4% (since there is always some turnover and slack). Currently, the rate of unemployment is sitting at 4.1% – so right at that ‘full employment’ mark. Does this indicate that the economy is starting to run too hot? Not so fast. There are a couple of indicators which suggest that these levels can be maintained for some time. 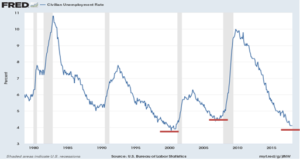 The first point of evidence is known as the U-6 rate, which measures not just the people looking for work, but also those who are working part-time, but would rather be working full-time. This rate sits at 8.2% and has room to come down. 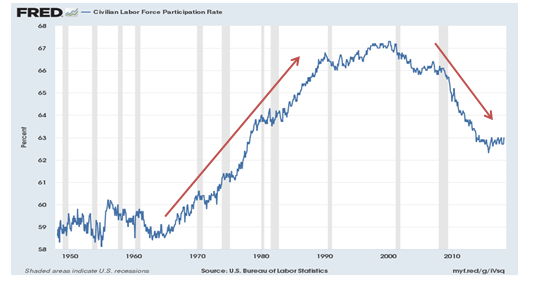 Also, the labor market participation rate (the percentage of the population who is included in the labor force) is still at a generationally low level. 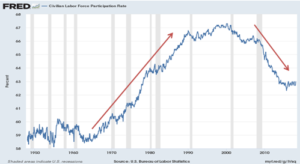 This rate started rising in the 1960’s, as more women joined the labor force, to a peak in the late 90’s of around 67%. That figure has fallen back to 63% as baby boomers are retiring, more people go on disability insurance, and the long-term unemployed have given up looking for work. If the economy continues to heat up more people could get back into the labor pool. So, while the economy is certainly warming up, it does not appear to be at risk of overheating in the near-term. We look at those areas below. One of the pressing mysteries of this long economic recovery has been the lack of wage growth across the country. I’ve seen an increasing number of stories about labor shortages in different regions and industries over the past year. 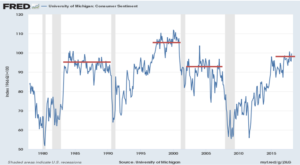 Whether it is construction workers in Colorado, bus drivers in Michigan, or snow plow drivers in Maine, it is interesting to see that despite these anecdotes, the national growth in wage income has not moved materially higher. One would expect that if there were a shortage of labor, then in order to fill the need, wages would have to rise. That wages aren’t going up broadly makes one wonder if the anecdotes are just simply isolated examples. One worry that goes along with slow wage growth is that while consumers may feel better, they still aren’t spending all that much money. 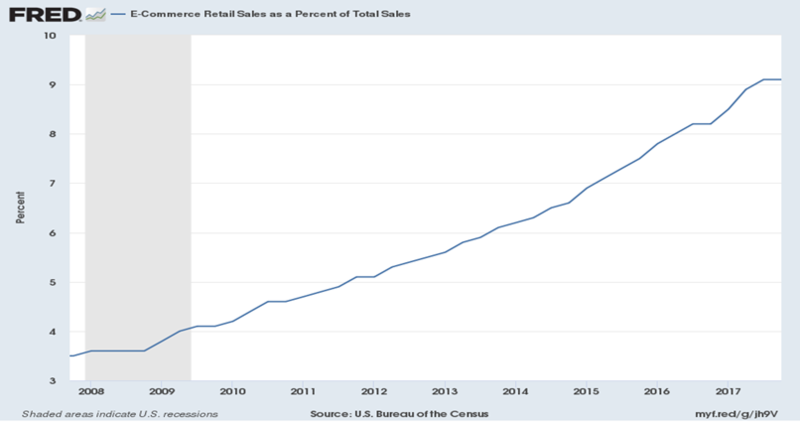 Retailers have reported a decline in sales over the past 3 months, and more of that money is going to online retailers which hire fewer people per dollar of sales. Companies like Amazon and other e-commerce offerings are making it easier for people to do their shopping from the coach. Figure 5: Consumers are moving more of their spending online. Given all the data we are observing, we still think that the odds of recession in the near-term are fairly low. We believe the most likely scenario is that the economy continues to grow, getting near the 3% level, modestly higher than where we are now. This is positive for company earnings and, therefore, positive for stocks to continue their rally. Risks to this forecast include heightened trade tensions between the U.S. and its trade partners. While recent tariffs on steel have had the positive effect of adding jobs to that industry, the increase in costs to companies like automakers could cancel out the benefits. Due to this forecast, we are maintaining our target allocation to stocks, though diversifying a little more into smaller capitalization markets. These smaller companies are set to benefit more from recently passed tax policy and have historically done well in the later stages of the business cycle. We are reducing our overweight to traditional large-cap stocks to fund this change, realizing some of the profits we have accrued in that space. So, enjoy the good feelings as both the weather and the economy continue to warm up. As always, we plan for what we think is most likely to happen but prepare for what could happen. In this case, we are planning for continued sunshine but keeping our umbrella handy. If you have any questions about this update or your account in particular, please reach out to our Trust & Asset Management department. We look forward to hearing from you.